Published in the South Kent Gazette, 31 December, 1980. Dover Museum, established In 1836, was the first undertaking. It was originally housed in the old Guildhall that stood in the centre of the Market Place, but in 1848 was moved to a gallery of the covered market hall. Another more followed after the building was badly damaged during the Second World War, and the museum is now housed on the Ladywell side of the Town Hall. The nucleus of the museum collection was given by Mr Edward Pett Thompson, who, as Mayor in 1836, was its founder. Since then there have been many other valuable gifts, notably one of a large collection of Kentish birds, given by Dr Plomley, of Maidstone, in 1854, and also some valuable natural history specimens presented by the Hon Walter Rothschild, The Museum is specially rich in local curios and this collection expanded to such an extent that in 1934 the accommodation at the old market hall was extended by the addition of a "Dover Room“ at the Queen Street side. Modem additions to the museum collection include a valuable series of water colours and pencil drawings illustrating Dover landmarks, dating from 1820-1850. Known as the Dunwoody Collection the 75 water colours and drawings were given to the town to commemorate the representation of Dover in Parliament from 1922 to 1945 by Lord Astor of Hever. The pencil drawings are by Thomas Hastings, an etcher and engraver, and date from the 1820s. The water colours and wash drawings are by S. J. Mackie, and date from the 1840s. At an early period, a section of the people of Dover desired the Corporation to obtain the Maison Dieu Park on the margin of the Dour for pleasure gardens; but it was not until about the year 1870 that the first step in the direction of providing pleasure grounds was taken by renting the Northfall Meadow, a rural and breezy area extending from near the top of Castle Hill to the cliff edge above Athol Terrace and what is now the Eastern Docks. The greater part of it has disappeared in constructing Jubilee Way. For years the Meadow was approached from East Cliff via a tunnel cut in the cliff in making a cliff path. Prior to the First World War the smooth turf in parts enabled it to be put to good use for playing cricket, there being few other grounds available in Dover. During the Kaiser war the Meadow was filled with soldiers’ barrack huts and German aircraft dropped bombs there at various times during the conflict. After the war a military parade ground was laid out, part of it became a football pitch and, under the Castle embankments, officers tennis courts were provided. But the public were not excluded from the land. The cliff tunnel disappeared when the Admiralty harbour was constructed and the face of the cliff was carved back. The path down the cliffs to East Cliff was a very rough one at first but in 1931 Dover Corporation carried out Improvements and laid concrete along part of the pathway. The establishment of Connaught Park in 1883 was a more important step. The formation of the Park was a happy thought, to which effect was given without drawing upon the Corporation revenues, the funds being provided by public subscription; but the annual cost of upkeep is charged to the rates. Granville Gardens, in the centre of the Sea Front, were opened by the Dover Harbour Board in 1878, but are now maintained by the District Council. The Danes Recreation Ground, off Old Charlton Road, was opened in 1891, during the Mayoralty of Mr W. J. Adcock, who negotiated its purchase; and the same Mayor, in 1886, had been instrumental in laying out, as a public footpath, Old Castle Hill, which forms an approach to the Castle end of Connaught Park. The Crabble Athletic Ground was laid out by a public company and taken over by the Corporation in 1902. In 1907 Kent’s county cricket club was induced to play a county match on the lower ground and attendance proved so good and the players were so impressed with the playing surface that it became a tradition until recent years to hold an annual Dover Cricket Week, two county matches being played for many years. The Maison Dieu public gardens are situated at a pleasant spot, each side of the Dour, at the rear of the Town Hall, part laid out as a bowling green and part as an ornamental garden. This pleasure ground, which was opened in 1906, and the tennis courts added adjoining Brook House nearly 20 years later, formed an instalment of the Maison Dieu Park, which local reformers of the early part of the 19th century desired to secure for the public. The tennis courts survived until recent years when they were replaced by a council car park. Hot and cold baths, with moderate Charges, were opened by the Corporation at the rear of the Town Hall in 1894 and six or seven years later Turkish baths adjoining them came into use. The baths were badly damaged during the Second World War but were restored and continued in use until recent years when they were considered to be redundant in view of the facilities available at the new Woolcomber Street swimming baths and sports complex. Indoor swimming baths were built on the Sea Fromt, next to Marine Court, in 1878. Owned by Dover Coorporation they consisted of two large swimming baths, one for men and one for women, together with several private baths. The swimming baths were destroyed by enemy action during the Second World War, and never rebuilt. The site is now a sunken lawn adjoining the old TA Hall. Both will disappear when /the Towniwall Street dual carriageway is extended through to the Sea Front in the near future. Apart from the old swimming baths there was a well equipped bathing station on the shone near the Prince of Wales Pier where, from Whitsun to October, the safest bathing on the coast was claimed by Dover. There were also two sets of bathing machines, one for men and one for women, which existed as late as 1906 when this book was written. By that time legal mixed bathing had come Into being and the Corporation, in the early part of the 20th century employed a safety boat to patrol up and down offshore in case battlers got into difficulties. The Allotments Acts were taken advantage of by the Corporation and land acquired at the upper end of Buckland Bottom, which was let for gardens. During the First World War the numbers of allotments increased rapidly and soon covered many acres of land which had not been developed, particularly on the gently sloping sides of the valleys at Tower Hamlets and Buckland. Practically half the top floor of the old covered market ball, in the Market Square, was destroyed by enemy action during the Second World War and most of the windows were blown out in the remainder of the building. The Corporation-owned Museum which was housed there was wrecked and safer accommodation had to be found elsewhere for the relics which survived the blast. 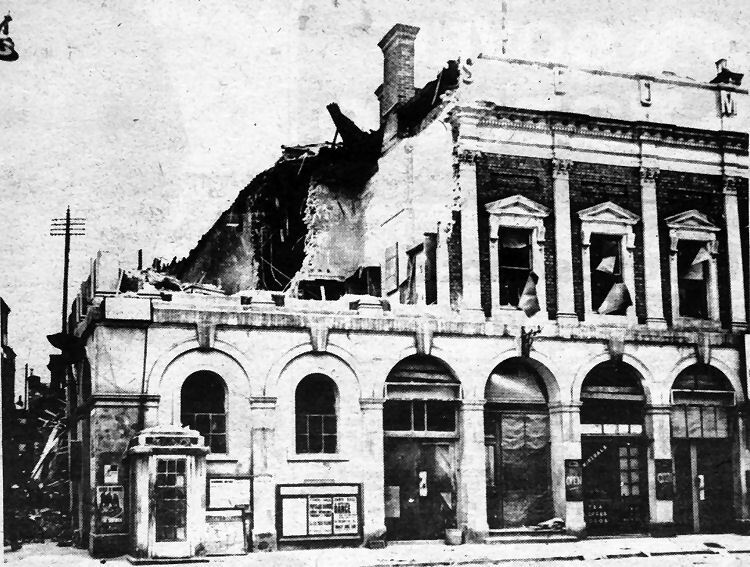 The Market Hall and Museum were wrecked by a bomb which was one of a group of 10 dropped on that part of town between Adrian Street and the Market Square, in October 1940. There was to be further damage almost exactly two years later when a shell destroyed the toilets in Gaol Lane built into the side of the Market Hall. The same night the Corporation’s public baths at the rear of the Town Hall were devastated by a shell which narrowly missed the Council Chamber at the Maison Dieu.